As someone who doesn’t travel much, my idea of what other countries are like comes primarily from novels, movies, and television shows. 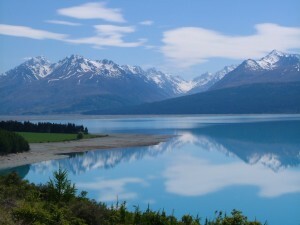 New Zealand has made my list of one of the countries I’d most like to see some day: this island country in the southwestern portion of the Pacific Ocean has developed it own unique biodiversity and culture due to its remoteness. I grew up reading New Zealand native Ngaio Marsh‘s Roderick Alleyn mysteries, several of which take place in that country. Together with Dorothy Sayers, Agatha Christie, and Marjorie Allingham, she is considered to be one of the four Queens of Crime–and helped usher in the Golden Age of Mysteries in the 1920s and 30s. So when I think of New Zealand, I think of it in Marsh’s terms–colorful birds, the Maori people, natural hot springs, and glorious mountain peaks created by a sharp shift in tectonic plates. I also think of it as I’ve seen it in The Lord of the Rings and Xena: Warrior Princess: rolling green fields, sharp ridges with breath-taking views, wind-blasted trees, and scarcely a human in sight. So you can imagine my delight when I hosted Anne Barwell a few months ago to talk about her stories. I was so intrigued by the fact that she’s from New Zealand that I invited her to come back and share more about life as a Kiwi with us! Take it away, Anne! We have a saying around here about not leaving home ’till you’ve seen the country. I must admit to not be that well travelled in my own country, so I figured I’d blog about where I’ve been recently and the places I’ve enjoyed visiting and why, and share some photos. Hopefully, that way it gives my ramble a bit of something different as I figure if you want a travel brochure on the country there are plenty of great sites to visit for that. I’ve lived most of my life in the Wellington region. I love it here. The suburb where I live is in a valley. I look at the window and see green hills on all sides. There were even sheep grazing on the hill until the housing development behind me blocked the view. Grrr. Fifteen minutes one direction and I reach the sea. That particular beach is still wild and relatively untouched apart from the lighthouse in the distance. 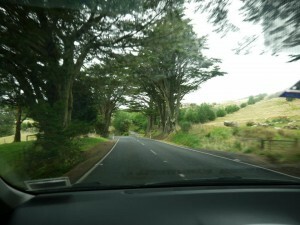 On the way there is a forest park with bush walks and a river. Half an hour in the other direction is Wellington city, but the closest city to me is only five minutes away. I love the way I’m close to everything but away from the rat race. 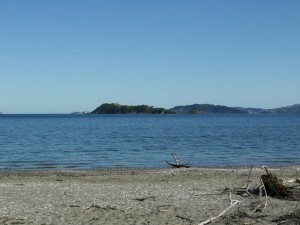 One of the descriptors used for Wellington apart from the harbour and greenery is the wind. There’s a reason why the local radio station is used The Breeze. Some residents aren’t fussed on it but I like it as it keeps the air circulating and helps prevent smog. We still get our fair share of fog though and the air port has been closed on occasion because of it. The last month or so has been a bit shaky too, following the 6.5 quake on the 21st July. That wasn’t something I want to repeat anytime soon and it had everyone on edge, which says a lot considering we’re on a fault and are used to regular quakes. Luckily things have settled down to normal since then and are behaving *crosses fingers*. 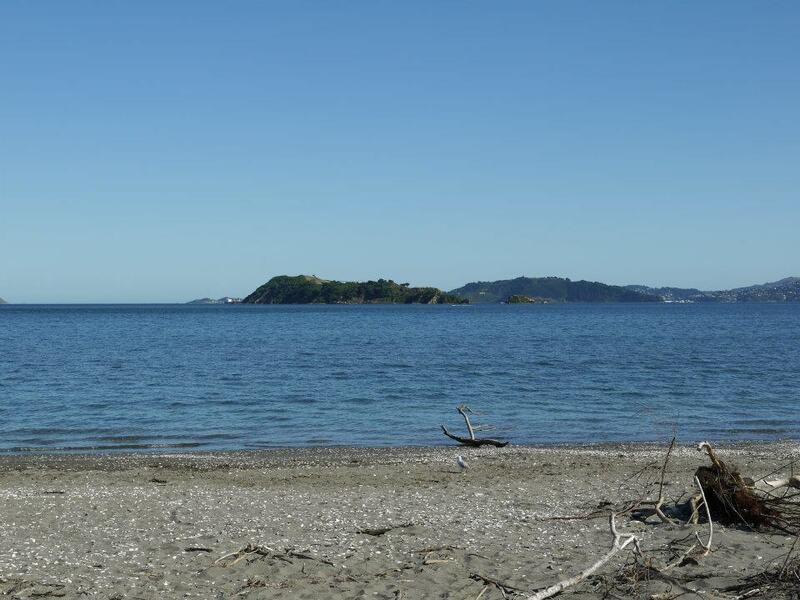 I’ve included a photo taken at Petone Beach, as it gives a view of Wellington harbour, with Somes Island in the middle of it. It’s also the location of one of my stories Slow Dreaming. That’s the exact spot for the scene where Jason and Sean sit on the wall and skim shells across the water. 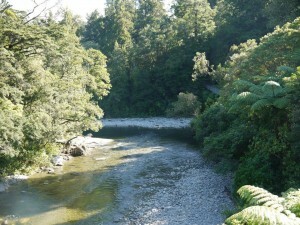 Another of our claims to fame has been the location shooting of the Lord of the Rings trilogy. Some of that was filmed locally, although if you look at the Rivendell photos there’s no sign it ever was. Gorgeous scenery though, even without the addition of elves and hobbits. 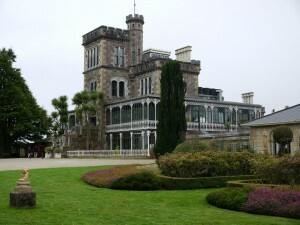 Last year I visited Dunedin and the West Coast in the south island. Fantastic scenery and very different from the East Coast which I’d visited years ago. 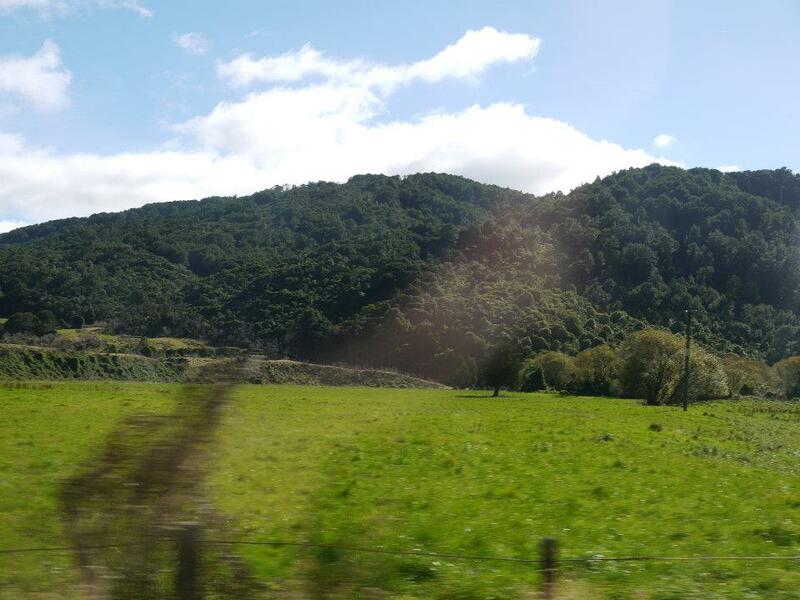 While Canterbury and the surrounding areas are very flat, the West Coast has a lot of hill country. It’s also very rural *points to the sheep photo*. 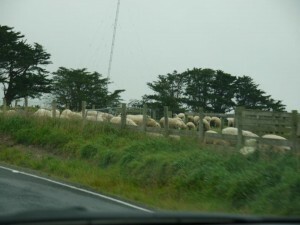 There’s a joke that NZ has a population of about 4 million people, and 8 million sheep. We drove for hours without seeing another car, and some places like Haast have no mobile coverage. Every place we stopped we ordered a pot of tea. One has to have one’s priorities when taking these kinds of trips. 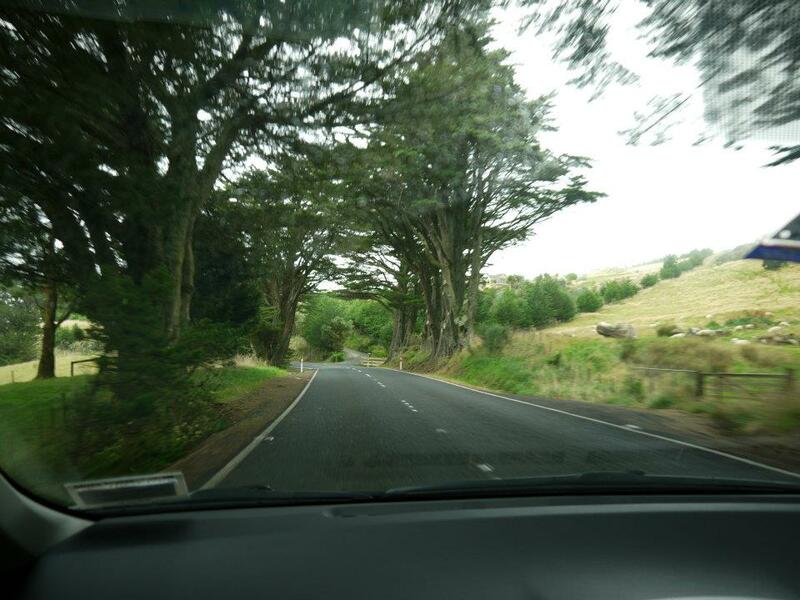 I’ve included a photo of part of the route we travelled to get to Lanarch Castle in Dunedin, and one of the castle itself. Unfortunately they don’t allow cameras inside the castle. It was very interesting and like stepping back in time. The gardens are well worth a look too, and well maintained. 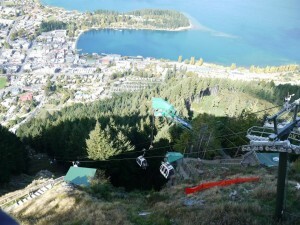 To finish I’ve included a photo of Queenstown which is south of Dunedin. I’m not one for heights so I’m still not sure how I got talked into riding on one of those gondolas. The view was great, but never again. I much preferred walking along the waterfront and taking in the sites that way. Queenstown is a tourist town, and well worth the visit. The scenery is fantastic and it was very easy to kill time by wandering the streets and taking in not just the views but the shops. Thank you, Anne, for sharing a bit of your country with us! You’ve only made me want to go there even more one day! 🙂 If you readers want to know more about Anne’s stories, you can find them on her page at Dreamspinner Press. Sarah Madison’s latest releases are The Boys of Summer and A Summer Fling. Check them out today! Thanks for the lovely travelogue! New Zealand is a country I really hope to see one day. One of my sons keeps saying he wants to relocate there, so who knows? But what beautiful scenery! It just seems like a lovely place with lovely people. Thanks, Tali. I love it here, but must admit there’s still a lot of the country I haven’t seen. Thanks again for inviting me back to talk about New Zealand, Sarah. 🙂 I hope you get the opportunity to come visit sometime.